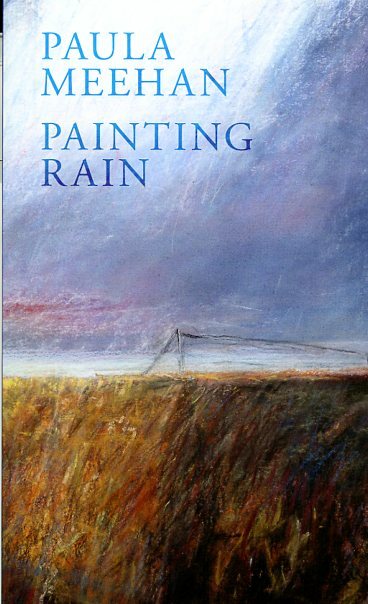 For November, the book of the month is Painting Rain, the 2009 collection of poetry from Paula Meehan. Painting Rain is full of sadness, and death, and memory; images of the present are wrapped up with the past. This is a book about how things change, will always change, will never remain the same. In the first poem, “Death of a Field,” a large and beautiful field transforms into yet another housing development. The next, “Not Weeding,” looks at how one’s perception of weeds can go from “sworn enemies” to “cherished guests” as man-made objects replace nature. Meehan mourns the loss of environment and unregulated growth throughout the collection, with many of her poems taking on an environmentalist, but not strident, tone. Meehan also mixes the language of childhood with the awareness of adulthood. In “At the Dublin Zoo,” “A four-year old / Seeing elephants / For the first time” says ‘But they’re not blue’”. She creates a sense of loss and disappointment of how reality differs from the picture-book view that a child who is isolated from real world experience has of it. For much of the collection, Meehan explores this dichotomy of childhood and adulthood. She dedicates poems to family members and friends, giving her reader a glimpse into her own past with poems such as “When I Was a Girl,” “At Shelling Hill,” and “My Brother Becomes a Man.” And she writes to her grandmother, uncle, aunt, and grandfather, sharing pieces of herself with the reader through her memories of her family. The audience watches her grow, sees her pain: at first she is a tree developing by herself in a field, watching a far forest, but over the course of the collection other trees in the form of people and humanity encroach on her open field. Paula Meehan was born in Dublin in 1955 as the eldest of six children and was raised in two working-class districts of Dublin before graduating from Trinity College. Currently, she serves as the Ireland Professor of Poetry, a position which she will hold for the next three years.